Deflation is potentially a very serious problem, because falling prices — and the expectation that prices will continue to fall — would make the current economic downturn worse in three distinct ways. The most direct adverse impact of deflation is to increase the real value of debt. Just as inflation helps debtors by eroding the real value of their debts, deflation hurts them by increasing the real value of what they owe. While the very modest extent of current deflation does not create a significant problem, if it continues, the price level could conceivably fall by a cumulative 10 percent over the next few years. If that happens, a homeowner with a mortgage would see the real value of his debt rise by 10 percent. Since price declines would bring with them wage declines, the ratio of monthly mortgage payments to wage income would rise. In addition to this increase in the real cost of debt service, deflation would mean higher loan-to-value ratios for homeowners, leading to increased mortgage defaults, especially in the US. A lower price level would also increase the real value of business debt, weakening balance sheets and thus making it harder for companies to get additional credit. The second adverse effect of deflation is to raise the real interest rate, that is, the difference between the nominal interest rate and the rate of “inflation.” When prices are rising, the real interest rate is less than the nominal rate since the borrower repays with dollars that are worth less. But when prices are falling, the real interest rate exceeds the nominal rate. But now the large US fiscal deficits are being accompanied by rapid increases in the money supply and by even more ominous increases in commercial bank reserves that could later be converted into faster money growth. The broad money supply (M2) is already increasing at an annual rate of nearly 15 per cent. The excess reserves of the banking system have ballooned from less than $3bn a year ago to more than $700bn (€536bn, £474bn) now. The money supply consists largely of government-insured bank deposits that households and businesses are holding because of a concern about the liquidity and safety of other forms of investment. But this could change when conditions improve, turning these money balances into sources of inflation. The deep recession means that there is no immediate risk of inflation. The aggregate demand for labour and goods and services is much less than the potential supply. But when the economy begins to recover, the Fed will have to reduce the excessive stock of money and, more critically, prevent the large volume of excess reserves in the banks from causing an inflationary explosion of money and credit. Update: Larry Summers is too, according to Antonio Fatas. 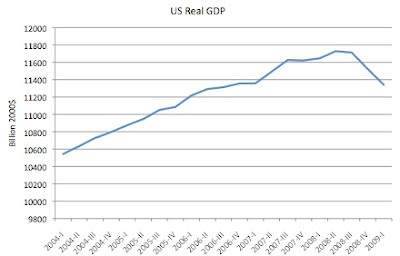 Real GDP fell at an annual rate of 6.1% in the first quarter, according to the BEA's advance estimate. This follows a 6.3% rate of decline in the fourth quarter of 2008... (Note: "annual rate" means that the pace of decline would result in a fall of 6.1% over a year, not that GDP decreased 6.1% in the first three months of the year). The reaction from James Hamilton at Econbrowser, Catherine Rampell at Economix and Justin Fox of Curious Capitalist includes a couple of hopeful signs: while investment plummeted (fixed investment fell at a 37.9% rate), consumption began to pick up, increasing at a 2.2% rate (durable goods purchases rose at a 9.4% clip). Also, a significant part of the fall was accounted for by a decrease in inventories, which would suggest firms may need to start increasing production. Of course, the data are subject to revision... we'll get the "preliminary" estimate on May 29. 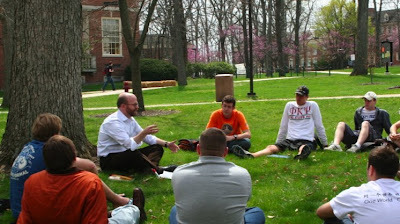 Last week, I took the international trade class outside. Since we happened to be sitting outside the external relations office, photos were taken... Opinions vary about whether I am a good professor, but I sure look like one, if I do say so myself. The Cleveland Fed's Economic Trends provides a useful overview of the Fed's alphabet soup of lending facilities. US News has updated its rankings of Economics PhD programs. Their rankings are based on reputation, measured using surveys. This is, I think, the best way of getting at one of the main things prospective students should consider: in general, the programs which will give you the best chances at getting a good job are the ones that people think are the best. That is why I prefer the US News rankings over studies that try to quantify the research productivity of departments. That said, any ranking is imperfect (especially any ranking where the University of Virginia is tied with Ohio State - good grief!) and there are many issues to consider; my advice for would-be economics PhD students is here. The three-day week began at midnight on New Year's Eve in 1973, a Monday. The Heath administration decreed that until further notice all businesses except shops and those deemed essential to the life of the country would receive electricity only on Mondays, Tuesdays and Wednesdays, or on Thursdays, Fridays and Saturdays. Non-essential shops would get power only in the morning or the afternoon. When the electricity was off, affected businesses would have to make do with candles, gas lamps, private generators or moving their workers next to windows to make the most of the brief winter daylight. Employees would have to wear extra clothes to keep warm. Beckett goes on to trace the roots of the crisis to the Heath government's economic policies - a tale of aggregate demand management gone awry - as well as the 1973 oil shock, and the militancy of the coal miners union. From its election in 1970, his government had impatiently sought to boost the performance of the British economy. But from 1971, frustrated by a general lack of progress and spooked by a sudden surge in unemployment, the Heath administration had sought this transformation by increasingly bold - you could say reckless - means. During late 1971 and early 1972, the government cut interest rates, greatly loosened the rules that governed lending by banks, increased public spending and cut taxes. "No government has ever before taken so much action in the space of one year to expand demand," declared the chancellor Anthony Barber on New Year's Day in 1972. For a time the results were spectacular: the gross national product, which had grown by a feeble 1.4% in 1971, grew by 3.5% in 1972, and by an almost precedented 5.4% in 1973 - the kind of rate usually achieved by Britain's economic superiors at the time, Germany and Japan. Between mid-1971 and mid-1973, house prices rose by almost three-quarters. But the boom was too reliant on speculation and one-off government initiatives, and too removed from the underlying realities of the British economy, to last long. Shortages of skilled labour and of modern, flexible industrial premises - the legacy of decades of underinvestment and poor training and management - meant that the increased appetite for goods and services awakened by the government soon could not be efficiently met. The result was higher inflation and a growing reliance on foreign goods, which were themselves inflationary, as the other rich countries were experiencing feverish booms and price spirals of their own. Britain's trade balance worsened drastically and the pound, which in 1972 had been freed to rise and fall in value against other currencies, began to fall much more than the Heath government had allowed for. In May 1973, Barber started to rein in its "dash for growth" by cutting public spending. In July, he raised interest rates to their highest level since 1914. Boom had not quite yet turned to bust; but the British economy entered the autumn in a delicate condition, even more vulnerable than usual to unforeseen problems. Then, on 6 October, came the biggest shock for western economies of the entire decade, and the second catalyst for the three-day week. In a surprise attack, Egyptian troops crossed the Suez Canal and invaded the Israeli-occupied Sinai Peninsula. The Yom Kippur war had started, and with it the 1973 oil crisis. The supply of Middle Eastern oil to Britain and other western countries was severely disrupted. By January 1974, the oil price was more than five times higher than two years earlier. Even worse, the British economic crisis acquired a potentially lethal political dimension. The leadership of the National Union of Mineworkers rejected a pay offer from the National Coal Board. During November and December 1973, as the second national coal strike of his government changed from a possibility into a probability, Heath's conviction that the miners' militancy was ideological - rather than, as it also was, opportunistic and materialistic - became entwined with his wish to avoid the blackouts that had accompanied the earlier coal strike; with the oil crisis; with his tendency to dig his heels in under pressure; and with his proclivity for state initiatives and economic planning. The result was the three-day week. And things didn't really get better from there - in 1976, Britain had to turn to the IMF for a loan (and now, there's talk they might have to do so again). Commentary on the financial crisis has included a great deal of misplaced economist-bashing. Much of this seems based on a misunderstanding of what economists do - the people saying "those stupid economists totally missed the housing bubble" miss the fact the vast majority of us are not forecasters, we are social scientists, and, usually rather narrowly specialized in something other than the housing market. The past two years have not enhanced the reputation of economists. Mostly they failed to point out fundamental weaknesses of financial markets and did not foresee the crisis, and now they disagree on appropriate policies and on the likely future course of events. Although more economic research has been done in the past 25 years than ever before, the economists whose names are most frequently referenced today, such as Hyman Minsky and John Maynard Keynes, are from earlier generations. Since the 1970s economists have been engaged in a grand project. The project’s objective is that macroeconomics should have microeconomic foundations. In everyday language, that means that what we say about big policy issues – growth and inflation, boom and bust – should be grounded in the study of individual behaviour. Put like that, the project sounds obviously desirable, even essential. I confess I was long seduced by it. Most economists would claim that the project has been a success. But the criteria are the self-referential criteria of modern academic life. The greatest compliment you can now pay an economic argument is to say it is rigorous. Today’s macroeconomic models are certainly that. There is some truth in that, and I'm more convinced than ever that I made the right choice keeping the IS-LM model and some of chapters 12 and 22 of the General Theory in my intermediate macroeconomics course. However, microeconomic foundations and departures from perfect rationality are not incompatible; just as the New Keynesians have been able to incorporate imperfect competition and nominal rigidities into dynamic, microfounded models, I would expect to see more "behavioral" elements integrated with some of the tools we currently use. The broader lesson seems to be that we must keep in perspective the limitations of economic models. I wouldn't be here if I wasn't convinced that they are useful - and I also wouldn't trouble my students with all those equations (an exercise which makes my life harder, as well as theirs), if I didn't see value in them. But no economic model is ever a complete description of the world, and models should be complements to - not substitutes for - intuition. I think that we ought to be turning out a lot of macroeconomic historians and historians of economic thought, and that only they should be allowed to serve in government or comment on public affairs at least as far as the business cycle is concerned. A good reading on the tug-of-war between practicality and elegance in modeling is N.G. Mankiw, "The Macroeconomist as Scientist and Engineer" (JSTOR access required). Last fall, in this earlier post I discussed a similar argument from YouNotSneaky! At the NY Times website, you can try 18 questions from the Economics Advanced Placement test. A while back, in the Chronicle of Higher Education, David Colander discussed the surging popularity of the economics major at liberal arts colleges. Most administrators and non-economist faculty members attribute that appeal to economics' relation to business. They assume that because liberal-arts colleges don't have business majors, the demand for economics is really just a demand for business. To some degree that's right, but it's only a small part of the story. As part of a report on the economics major that I am working on for the Teagle Foundation, my students and I conducted a survey of more than a thousand students majoring in economics at more than 30 institutions. We found that only 19 percent of the respondents said that the job-training aspect of the economics curriculum had been very important to their choice of major. Moreover, only 36 percent said they were planning to work in business. The others were planning to go on to professional school or work for a nonprofit organization, or had no specific plans. The reality is that at most liberal-arts colleges, economics is taught as a social science far removed from business. Companies like to hire economics majors from liberal-arts colleges not because the students have been trained in business, but because they have a solid background in the liberal arts. What I hear from businesspeople is that they don't care what a job candidate has majored in. They want students who can think, communicate orally, write, and solve problems, and who are comfortable with quantitative analysis. They do not expect colleges to provide students with specific training in business skills. If the economics major's popularity is not due to its intellectual dynamism or connection to business, to what is it due? I suspect a mundane explanation: It is the "just right" major. By "just right" I mean that the economics major provides the appropriate middle ground of skill preparation, analytic rigor, and intellectual excitement that students look for in a major, and that employers look for when hiring students. Consider the results of another question in my survey. We asked economics students to identify majors as hard, moderate, or easy, and we found that 33 percent viewed economics as hard, 3 percent said sociology was hard, 7 percent saw psychology as hard, and 13 percent thought political science was hard. Since other social sciences were the primary alternative majors that most of the economics students considered, that data is compelling evidence that the respondents perceived those other majors as too easy. Students likely reasoned that taking a "too easy" major would signal to potential employers that the student had chosen an easy path through college, thereby hurting their chances of being hired. Of course, as I've argued before, the real value is not practical at all, but rather that education can help us live "wisely, agreeably and well" (as Keynes put it in "Economic Possibilities for our Grandchildren"). A Bad State for Finance? The main economic argument that the proliferation of financial derivatives has been beneficial is that it has moved us closer to the theoretical world of "complete markets" where agents can insure themselves fully against idiosyncratic risk. That is, we can make arrangements to make payments in the circumstances where we are well-off in exchange for receiving them when we are badly-off. For example, commodities futures markets allow farmers to insure against swings in the prices of their crops by locking in a price in advance (so the farmer loses some of the upside of a price increase, but avoids the downside of a price decrease). By doing so, welfare is improved, because we are reducing our consumption when it is high (and marginal utility is low) and increasing it when it is low (and marginal utility is high). That is, the "consumption smoothing" logic of the life-cycle/permanent income hypothesis that holds over time also applies across different states of the world. If financial assets are traded that pay off for each possible state, then markets are said to be "complete." However, at his Maverecon blog, Willem Buiter argues that derivatives markets have strayed far from their insurance purpose, and that they do involve real resource costs and, in some cases, create, rather than reduce economic inefficiency. Following his suggestion to curb these markets would be consistent with Paul Krugman's recent argument that the economy would benefit if we return to a world where finance is boring (and less remunerative). Ivy League seniors appear to see that change coming, as the Times reports their preferences are shifting away from finance as a career. Although it can be alarming how relevant the Great Depression sometimes seems today, it is reassuring that the policy response has reflected the lessons learned (at least in the US). Monetary policy has been very aggressive, partly because Ben Bernanke understands those lessons as well as anyone, and because the Fed is not limited by gold standard the way central banks were in the 1930's. If Ireland still controlled the levers of economic policy, it would have slashed interest rates to near zero to prevent a property collapse from destroying the banking system. The Irish central bank would be a founder member of the "money printing" club, leading the way towards quantitative easing a l'outrance. Irish bond yields would not be soaring into the stratosphere. The central bank would be crushing the yields with a sledge-hammer, just as the Fed and the Bank of England are crushing yields on US Treasuries and gilts. Dublin would be smiling quietly as the Irish exchange rate fell a third to reflect the reality of trade ties to Sterling and the dollar zone. It would not be tossing away its low-tax Celtic model to scrape together a few tax farthings – supposedly to stop the budget deficit exploding to 13pc of GDP this year, or 18pc says Barclays Capital. If the tax raises were designed to placate rating agencies, they made no difference. Fitch promptly booted Ireland from the AAA club anyway. Above all, Ireland would not be the lone member of the OECD club to compound its disaster by slashing child benefit and youth unemployment along with everything else in last week's "budget from Hell". Depression buffs will note the parallel with Britain's infamous budget in September 1931, when Phillip Snowden cut the dole and child allowance to uphold the deflation orthodoxies of the Gold Standard – though in that case the flinty Pennine rather liked hair-shirts for their own sake. Though few had any inkling at the time, Snowden's austerity drive would soon push British society over the edge. It set off a mutiny – a Royal Navy mutiny at Invergordon over pay cuts, in turn triggering a run on sterling. The pound was forced off Gold within days. Irish deliverance from EMU will not be so easy. Brian Lenihan, Ireland's finance minister, said the economy would contract 8pc this year on top of the terrifying 7.1pc drop in the final quarter of last year. But what caught my ear was his throw-away comment that prices would fall 4pc, which is to admit that Ireland is spiralling into the most extreme deflation in any country since the early 1930s. Or put another way, "real" interest rates are rocketing. This is torture for a debtors' economy. You can survive deflation; you can survive debt; but Irving Fisher taught us in his 1933 treatise "Debt Deflation causes of Great Depressions" that the two together will eat you alive. [Ireland] was betrayed again by the European Central Bank, which opened the monetary floodgates early this decade to nurse Germany through a slump, holding rates at 2pc until late 2005, despite flagrant breach of the ECB's own M3 money targets. Fast-growing Ireland and the Club Med over-heaters were sacrificed to help Germany. They were left to cope with credit bubbles as best they could. And now, when the boom collapses, it is forced into overly-tight monetary and fiscal policies, which only make matters worse. Abandoning the Euro would be very costly, but it this crisis is revealing that the costs of membership are higher than many realized. At Vox, Barry Eichengreen and Kevin O'Rourke have some scary graphs showing that, over the past year, some economic data looks as bad as or worse than during the first year of the Great Depression. (As further evidence of the burgeoning popularity of scary graphs, their pictures have been picked up by Paul Krugman, Ezra Klein, Yves Smith and David Beckworth). 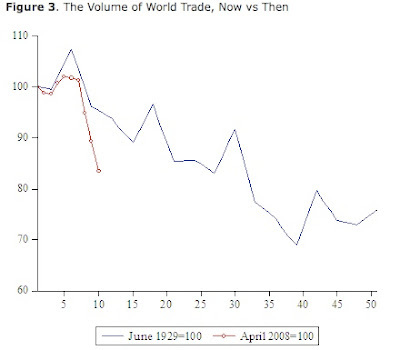 One of them is the decline in world trade volumes: I would suggest that things aren't quite as scary they seem, because a growing proportion of world trade is in intermediate goods, and this leads to some double counting in the trade statistics. For example, consider an iPod which is worth $150 when it leaves China, and includes a $70 hard drive made in the Philippines (this is a simplified from Hal Varian's article about the global production of the iPod). If China exports 1 less iPod, its exports decrease by $150, and the Philippines' exports decrease by $70. The total decline in world trade is $220, which is greater than the value of the iPod itself because the hard drive gets counted twice. This "vertical specialization" where different parts of the production process occur in different countries is much more prevalent today than in the 1930's, and it provides one reason why the decline in trade appears so much more dramatic now. Update (4/24): Mea culpa. I realize (thanks to Paul Krugman (!)) that I was thinking about this incorrectly... while intermediate goods trade does lead to double counting, which would make the decrease in the amount of trade appear excessively large, the double counting also affects the base from which the decline occurs, so the percentage change is not exaggerated. 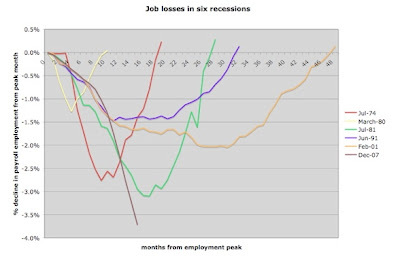 Time's Justin Fox has been among those holding the "not quite as bad as 1982" line, but with the latest employment report, he capitulates, and posts this scary chart: Indeed, this recession has really been a maneater, and that is also true if one looks at the change in the unemployment rate (relative to the 'local minima' around the business cycle peak dates): Nonetheless, I can't go for that, because (as I've discussed previously) the horrors of the early-1980's economy can only be appreciated by looking at the 1980 and 1981-82 recessions in tandem. 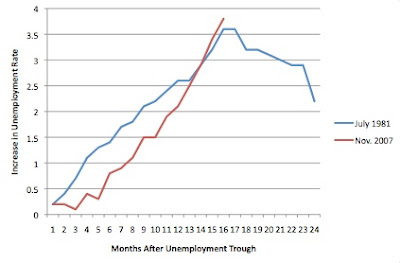 While Fox's chart shows that payroll employment did recover in late 1980, the unemployment rate really didn't, and the combined increase in the unemployment rate was still somewhat worse than what we've seen so far: And if we do match that total 4.9 point rise in the unemployment rate, it would take us to 9.6%, which is still considerably short of the 10.8% level reached at the end of 1982 (because we started from a low point of 4.7% in Nov. 2007, vs. 5.9% in Nov. 1979). Economix has a useful "F.A.Q." 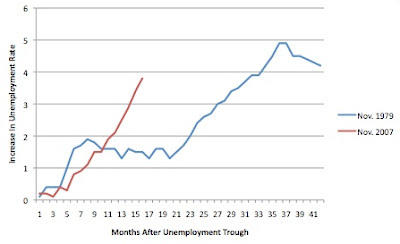 on the unemployment data. Much of the debate over how well - or poorly - the administration and Fed are dealing with the financial crisis centers on comparisons to the Japanese crisis of the 1990's. In the latest iteration of that debate, The Economist's Free Exchange frets that we are repeating Japan's mistakes (as does Krugman), but James Surowiecki continues to think the comparison is strained. The administration's plan to shore up banks sector by lending money to funds that will buy some of their sketchy securities and atrocious assets continues to get mixed reviews.... Joe Stiglitz does not like it, but Martin Feldstein thinks its a good start.